"wins whichever way you chose to use it"
I'm proud to present you the latest of the IBS series, version 9.0. A system that has been most thoroughly tested for all aspect of all even games on all tester books and randomly generated decisions. IBS9 - the Infallible Baccarat system version 9.0 is the result of 8 years of continuous research and development ever since the very first version of IBS, that was launched in December 2003. Each version provides you with a different way of winning long term in terms of various bet selections and methods. As each version progresses, the goal is to design a system, that is more profitable the more you use it, the more solid, the more logical in why it could win, the more avoiding losing sequences and the more taking advantage of profitable events, approaching more and more a perfect solution for winning in casinos consistently and on the long run. Having this mission in mind, IBS9 has an extremely smart bet selection, that identifies certain betting zones for a certain even bet area, where profitable runs are closed very frequently, all at the same time skipping zones, that could trigger a losing sequence. When one bets so on a specific even bet, whether it is Player in Baccarat or Even side in Roulette or Pass-Line in Craps, this particular side identifies its own zones for betting. The bet selection is so smart, that if one would bet on the opposing side of the even bet, such as on Banker only or Odd in Roulette or Don't Pass-Line in Craps, the system would profit similarly. So, there are parts of the system, which focuses on one side of the even bet and shows you winning strategies, while not betting on the other side. Yet, when the same strategy is applied to the other side, similar profits are made. Eventually, towards the end of the document, you will see how one player can bet on both sides to increase the profits. This is achieved with no differential betting, that is, never betting on both sides simultaneously. The system is so smart, that it bets on the appropriate side when the time comes and simply switches to the other side, when one side is not active. What happens in the end, that when one applies the system on both sides, one uses the system alternately on each side. One side becomes active, when the opposite side is inactive and vice versa. Each side making its own profit, following its own scheme and multiplying profits. Betting on two opposite sides of the even bet, one ends up placing bets 98% of the time. This way no casino will ask you to leave the table, for not placing bets too frequently. It also makes the system very attractive, dynamic and effective in terms of profits. Does the system close each and every single run? No. There are certain abandoned runs, with a certain accepted loss amount. Those amounts do not disrupt the overall profitability and positive results of the system for the extensive usage. Playing on the P (Player) side of Baccarat, for instance, IBS9 generates a profit of 2213 units for the entire 600 Zumma shoes. Playing on the B (Banker) side only, IBS9 generates a profit of 414.95 units. This is lower than on the P side, because of commissions. The system is profitable despite all Banker win commissions. No special routine is used. Simply apply the 5% commission when bets are won on Banker. Betting both on the P and B side in Baccarat, the total profit is 2213 + 414.95 = 2627.95 units. This is achieved with a maximum bet amount of 537 units, which is ideal for 1-600 range tables. We never really place that amount on the table, because the system is built in such a way, that if the next bet exceeds the set maximum, it is not placed and the run is abandoned with the accepted loss amount, which still leaves us in the positive profit area. Playing at $20 Baccarat tables, this makes a profit of 2627.95 X 20 = $52,559 for 600 shoes including abandoned runs, commissions, etc. Since each shoe takes about an hour to play, this profit can be made in 600 hours of play, or about 2 months, depending on the frequency of your play. As per Roulette, the system generates a profit of 1384 units playing for instance on the Even and Odd sides for the entire 15000 Zumms spins. 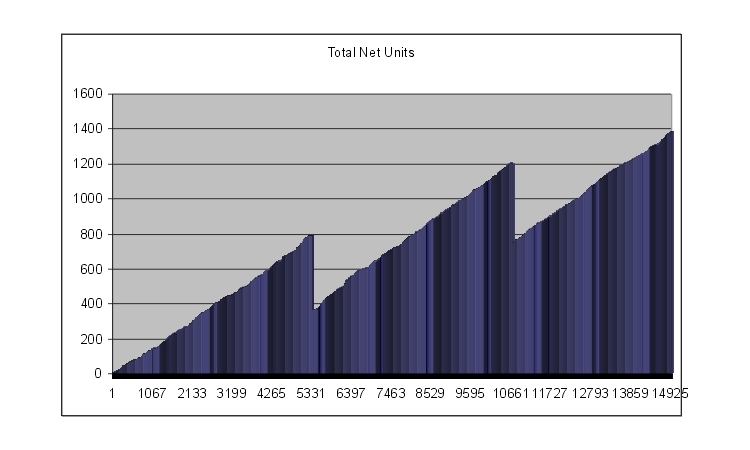 On the Even side, it generates a profit of 1106 units and on the Odd side, a profit of 278, totaling to 1384. This is achieved with a maximum bet set to 400 units and only 2 runs are abandoned throughout all 15000 spins. The average profit for Roulette is thus 1 unit for every 30 spins per even bet side. You can apply the system to all 6 even bet paying sides (Reds, Blacks, Evens, Odds, Highs and Lows) either alone or with a team of friends and multiply your profits 6 fold. As you can see, the two abandoned runs do not disrupt the overall profitability of the system and doesn't even bring us to a negative balance. The system is not hard to learn. Once you grasp the idea, you will get a good feel of it. The challenge is to use it on both sides of an even bet. The system document provides you easy ways to handle this. With little practice you will be able to use it live and win day after day using the system. The system document consists of 37 pages of very structured text, including 13 examples of various different cases. It is very thorough covering everything that can happen during the use of the system. The system document is accompanied with 4 large simulations (8MB each zipped) for Baccarat and Roulette, that will be sent to you in separate attachments. The simulations show each and every step of your bets, illustrating how the system wins all Zumma tester books for Baccarat (600 shoes) and Roulette (15000 spins). Any additional simulation can be requested on special demand, as the system includes all types of tests for all environments - real and random decisions and all even paying games. The simulations are totally automated, meaning first that the system is totally mechanical and there are no bets, that are results of guesses or self made decisions. And second, that you can input your own data, such as your own shoe decisions or spins and the system will tell you exactly when, how and how much to bet, displaying all results. The system package is $190 only, a cost which will be returned to you within the first day of the use of the system.